What is “history” for some is “current events” for others; events, objects, and stories that are fully familiar to me may well be unknown to those younger than I. Because history has different meanings for different people, our views of preservation, collecting, and heritage interpretation need to be broadly inclusive. In this issue of the magazine, we examine what can be learned from looking at the home of one of New England’s most distinguished families, as well as at antique clocks and historic vehicles, and we consider how laundry was done in the days before the labor-saving appliances of today. Why do we look at topics like these? Historic sites and collections open windows to the past and offer glimpses of lives lived differently, whether they are those of prominent people or of washerwomen, whose stories rarely come to our attention. I suspect that you can find parallels in your own experience and that you can compare the clocks and cars of the past to those you use today. This is why we preserve houses and landscapes, collections and documents, and especially the stories of New England’s past. We use these things to better understand our own world and the changes we face in it every day. The Codman Estate in Lincoln, Massachusetts, comprises the main house overlooking a pastoral landscape, several outbuildings, and two secluded gardens. Photograph by Aaron Usher. Except where noted, all historic photographs and ephemera are from Historic New England’s Library and Archives. above At sunrise, the lead boat tows longboats from the shore to the fishing traps, a trip that takes less than half an hour. By comparison, commercial trawlers need twentyfour hours to reach the now-overfished grounds of Georges Bank. below Corey Forrest and her daughter represent the fourth and fifth generations of the Wheeler family in the industry. The exhibition is on view from June 12 through September 3; please visit southcountymuseum.org or call 401-783-5400 for information on open hours and directions. The showing is partially funded by the Rhode Island Council for the Humanities. For more on Historic New England’s 100 Years, 100 Communities initiative, please visit HistoricNewEngland.org. ew England gives up its secrets grudgingly. The Boardman House in Saugus, Massachusetts, has been playing hide-and-seek with architectural investigators since William Sumner Appleton acquired it for Historic New England in 1914. Only recently though, within the past three years, has it given up answers to two big questions that have baffled historians for almost a century: When was it built? And how did it function? It turns out that the answer to the second question fits a critical missing piece into a larger historical puzzle that scholars have long been trying to solve. downstairs and two corresponding chambers overhead. The lean-to kitchen behind the house was a later addition. That was plain enough. A portion of the rear wall had been torn out to make room for a new flue from the kitchen fireplace. But when? The answer was surprising— by 1696, shortly before Boardman died. The inventory was unequivocal. The hall, formerly the kitchen (with a bake oven built into a corner of the firebox), had already been upgraded to become “ye best room.” Cooking and dairying had moved into the new lean-to with all the necessary kettles and churns, plus, significantly, the trammels and andirons that prove that the lean-to shed had indeed become the household’s working kitchen. When the kitchen was moved into the original lean-to sometime before 1696, the studs in the back wall of the attic were amputated to make room for a brick flue. that afternoon. It cast long shadows across the clapboard-covered back wall in the attic space above the kitchen. There, he noticed that the oak boards showed no signs of weathering whatsoever. They looked as fresh and new as the day the carpenter nailed them up. No, wait—their appearance changed farther along the wall. To one side of the chimney post they did look brandnew, but to the other all were deeply weathered. rings can reveal the exact date that trees were felled to build a timberframed house. No more “circa.” This time, too, the scientific answer came in right on the button. Boardman bought the farm in 1686/7, but he didn’t get around to building a house until 1692. His wife wasn’t so pokey. She remodeled her kitchen less than four years later. Gentility came to Saugus in a hurry. The dendrochronologists also cleared up the mystery about the bigger, better lean-to that’s attached to the house today. It replaced the first one in 1731. Cummings’s hunch about the feather-edge boards had been dead right all along. —Historian Cary Carson, vice-president for research at the Colonial Williamsburg Foundation, now retired, and Abbott Lowell Cummings, former director of Historic New England and author of The Framed Houses of Massachusetts Bay, 1625–1715, collaborated on this article. The Boardman House is open on the first Saturdays of the month from June through October. For information, visit HistoricNewEngland.org or call 978-768-3632.
hen you visit Casey Farm in Saunderstown, Rhode Island, during the growing season, you can expect to find a flurry of activity. This year, in addition to farmers and members of the Community Supported Agriculture (CSA) program at work in the fields, youâ&#x20AC;&#x2122;ll see carpenters and masons repairing the farmhouse and outbuildings. The property is currently receiving the focused attention of the Preservation Maintenance Fund. The c. 1750 Casey Farm, surrounded by impressive stone walls, is still a working farm. above Damaged sections of the stone walls will be carefully repaired. below The corn crib will also be stabilized. To learn more about the Preservation Maintenance Fund challenge grant, or to make a donation, please visit HistoricNewEngland.org/PMF. Casey Farm is open Tuesdays and Thursdays from 1 to 5 pm, and Saturdays, from 9 am to 2 pm, through October 15. The Coastal Growers’ Markets are held on Saturdays, May 14 through October 29, from 9 am to noon. the Codman Estate, in Lincoln, Massachusetts. The impressive three-story structure sits on a terrace above landscaped grounds, conveying an image of wealth, cultivation, and family pride. Its rooms are filled with an accumulation of furniture of different periods, family portraits, old master paintings, books, china, and bric-a-brac; there are yards of chintz, and some of the upholstery is a bit frayed and tattered. There are also stories of illustrious and not so illustrious ancestors, fortune and misfortune, and the eccentricities of later generations. And, like an English country house, the property has matured over its two hundred and seventy years. Through a series of complicated architectural and decorative changes, it has grown from the six-room house built around 1740 by Chambers Russell to become the twenty-two-room mansion crammed with family possessions and memorabilia that visitors see today. John Codman’s expansion of the house created an impressive stair hall. The arch on the landing marks the position of the rear wall of the original house. ABOVE LEFT John Codman by John Singleton Copley, 1794. ABOVE RIGHT The drawing room was redecorated in the 1930s. Ogden Codman, Jr.,’s favorite chintz, Les Roses, covers the furniture. The Codman Estate is open through October 15 on the second and fourth Saturdays of the month, from 11 am to 4 pm, tours on the hour. left These two models illustrate the dramatic changes made to the original house in the Federal period. The drawing room bay is visible on the left of the lower model. middle The Victorian updating of the house in the 1860s retained the elegant 1740s paneling of the best parlor. Marcotte’s New York showroom in 1863. The red and green wallpaper illustrated on the next page was used in this room. (see contents page). right Another photograph by Tom Codman shows that the drawing room became quite cluttered after the family returned to Lincoln for good in 1897.
completely change his idea of the tasteful interior and indeed have a major impact on the appearance of the rooms of The Grange after the family returned to Lincoln for good in 1897. During the 1880s and 1890s, Ogden had made a careful study of the house’s architectural elements that had been reused or removed and stored during the 1860s remodeling and drew detailed plans of how the house might have looked around 1800, which to him had become the golden age of the place. Perhaps as a conscious gesture to celebrate the centennial of John Codman’s Federalization of the house, Codman restored the walls of paneling in the two front bedrooms in 1899, replacing “those dreadful mantels” that his Uncle Sturgis had designed. He took a less archaeological approach to furnishing and decorating the rooms, perhaps in part because his mother had her own ideas and also held the purse strings. Before she returned from France, Ogden had sent her shopping for a toile fabric for her bedroom just like the one Edith Wharton had used in hers. Sarah eventually bought the fabric as well as some others that were used in the newly redecorated rooms. Ever frugal, she made up the curtains before leaving France so they would be considered used goods and therefore she would not have to pay duty on them. In the early twentieth century, life at The Grange settled into a quiet pace. Gone were the ambition and optimism of the previous two centuries. Ogden, the father, lost interest in the place and preferred to travel. Sarah was quite content to stay home. She surrounded herself with her unmarried children, and they enjoyed music, painting watercolors, gardening in the new Italian garden, and reading a prodigious amount, both in French and English. It was almost as if they were trying to recapture the life they had missed during the time they were away in France. of the toiles purchased in France in the 1890s by Sarah Codman. The design on the bottom is the one her son Ogden urged her to buy because Edith Wharton had used it in her bedroom. These bottles are among the collections at Historic New England’s Barrett House, New Ipswich, New Hampshire, open the second and fourth Saturdays of the month, from June 1 to October 15. For more information, visit HistoricNewEngland.org. For most of human history, people got around on foot and never traveled very far. Even after horses and cattle were domesticated, travel was difficult because roads were often impassible. Today, we think nothing of getting in a car to go somewhere. Let’s look at how transportation has changed. Sumerians in Mesopotamia (present day Iraq) use wheeled vehicles for transport. Romans start building roads across their empire. 1600–1800 Travel in New England is mostly done by water. what is it? This is a view under the hood of a 1936 Pierce-Arrow limousine at the Phillips House in Salem, Massachusetts (see p. 33). The shiny object is the car’s oil can, which sits on a special hinged shelf just near the engine in front of the driver’s seat. The family’s chauffeur, Clarence Sullivan, would use this oil can to help keep the car engine running smoothly. matching game Horse-drawn vehicles Match the number of the photograph to the description of the vehicle. Phaeton, 1880–90 The Phaeton was a lightweight and sporty carriage that would be driven by the owner. With an open body, it was well adapted to show off ladies’ costumes. Rockaway, 1830–40 The Rockaway, a light, fourwheeled carriage with a driver’s seat at the front under a projecting top, was intended as a family carriage. Portland Cutter, c. 1850 The popular Portland Cutter, a one-horse open sleigh, was developed in Portland, Maine. In winter, people loved to bundle up in a sleigh and glide easily over snowy roads. Brougham, mid-1800s The Brougham was a fashionable enclosed carriage with a coachman’s seat, invented in Great Britain. Governess Cart, c. 1900 This type of carriage, often used for transporting children, was drawn by a small horse or pony. c. 1850 Travel by carriage increases as road conditions improve. Henry Ford produces cars using an assembly line. The Nissan Leaf, the first all-electric car, goes on sale. Boston b uilt the nation’s first subway. Soapbox Truck Materials small cardboard soapbox acrylic paint and brushes scissors glue or tape craft wire 4 buttons 2 beads toy figure stickers, beads, marker Instructions 1. Paint the box and let it dry. 2. Set the box on one of the long sides. The box top will become the front of the truck. 3. Cut away the upper corner of the truck front and glue the lower part closed. 4. Glue the beads to make headlights on the front of the truck. 5. To attach the back wheels, insert craft wire through one side of the truck and out the other, about one inch from the back and close to the truck floor. Slip each end of the wire axle through one of the holes in a button, and then bend the wire back through another hole and twist to secure. Repeat this process for the front wheels, inserting the wire just behind the driver’s seat. 6. Decorate the truck with stickers, additional beads, or permanent marker, and let your toy figure take it out for a spin. Soapbox Cars Around 1900, boys started making small cars by attaching wheels to wooden soapboxes or orange crates and racing downhill. The races attracted spectators. Soon, local community groups began organizing and sponsoring them. In 1934, the Soap Box Derby World Championship Race, a highly competitive national event, was founded. By that time, the cars were no longer assembled from makeshift materials but were designed for speed, although they still had to be powered by gravity alone. The derby’s heyday came in the years after World War II, when celebrities and movie stars, along with thousands of other Derby fans, attended the annual race. Make a soapbox truck for your favorite action figure to drive. This late nineteenth-century trade card uses a goddess to promote Keystone Wringers. Above Soapine, touted as “the Dirt Killer,” was one of the first manufactured laundry powders. effort of doing laundry. below Wringers saved strain on hands and arms and caused less damage to clothing. below A laundry stove with multiple irons and a set kettle at the Phillips House. By the early twentieth century, a single electric iron began to replace the battery of flat irons needed to do the ironing. bottom left Starch gave clothes a crisp texture and glossy surface, which helped them stay clean longer. bottom right This trade card, c. 1880 for the Conqueror Wringer depicts ironing as a pleasurable activity. younger man learned well. His method for building clock movements echoed that of his master (and Wilder’s master as well). Both men, for example, often cut openings in the brass plates to save costly metal, an efficient but rarely employed technique. Historic New England has long been special to me. I cherish the years that I worked there and retain fond memories of cataloguing its furniture. Yet the clock collection always seemed daunting, even intimidating—until I met Gary Sullivan. “Clocks are all that matter,” he sometimes says. As I’ve learned from studying these two examples at the Winslow Crocker House, he may be right. Harbor and Home: Furniture of Southeastern Massachusetts, 1710–1850, by Brock Jobe, Jack O’Brien, and Gary R. Sullivan, won the Historic New England Book Prize in 2010. 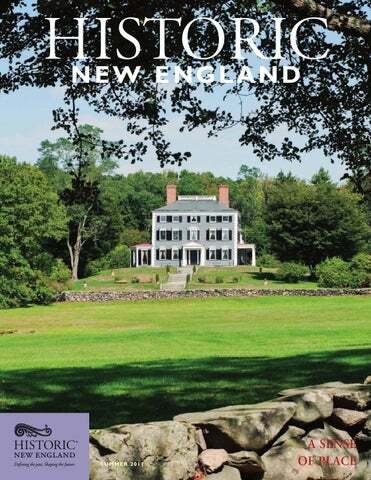 The book may be ordered from the Museum Store at HistoricNewEngland.org or by calling 617-227-3956. Samplers by Hannah and Loka, made at Wailuku Mission, Maui, 1844.
n 1844, when Hannah and Loka (we do not know their full names) set the first stitches in these samplers, they were two of more than fifty Hawaiian girls learning the art of embroidery in the American Board of Commissioners for Foreign Missions’ Female Seminary at Wailuku, on the island of Maui. 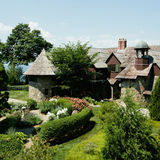 Richard Nylander, Historic New England curator, discovered the two embroideries at the Sayward-Wheeler House, York Harbor, Maine, after the organization acquired the property in 1977. How did these examples of missionary students’ work end up halfway around the world? The answer lies in the long-term connection between New England and Hawaii. Around 1820, the first Congregationalist missionaries arrived in the islands from New England to bring the gospel to the Hawaiian people. Henry T. Cheever, a Congregational minister who supported the missions, acquired the samplers, either by gift or by purchase at a fair. A lively journalist and correspondent, Cheever made several visits to the Sandwich Islands, as they were then called, and published his impressions of island life in two volumes, Island World of the Pacific, 1850, and Life in the Sandwich Islands, 1851. The samplers descended in the Cheever-Wheeler family and remain part of Historic New England’s outstanding needlework collection. The encounter between the New England missionaries and the Hawaiians must have been attended by incomprehension on both sides. The New Englanders, like many missionaries, arrived with preconceptions and almost certainly had little understanding of Polynesian culture. Many of them deemed the Hawaiians sinful and lazy. provided for girls in New England. Learning spinning, weaving, knitting, dressmaking, and embroidery prepared the girls for the future and developed virtuous industry. Throughout the 1840s, Wailuku Seminary struggled on a tight budget to teach and feed its students. To raise funds, the seminary proudly trumpeted the numbers of converts baptized, graduated, and led to become missionaries elsewhere in Hawaii. These extraordinary survivals are two of only three Wailuku samplers known. Their silken stitches document the complicated relationship between the Hawaiians and the Christian missionaries, between the Native culture and the nineteenth-century American ideals imposed upon it. —Laura Johnson Associate Curator Female Seminary at Wailuku, Hawaii. Drawn by Bailey and engraved by Kapeau, c. 1840. Castle Tucker, with its vehicles on display, is open June 1 to October 15. The Phillips House is open year round, and its vehicles are on view from May through October. Don’t miss the Tenth Annual Phillips House Car Meet on Sunday, August 14, from noon to 3 p.m. Please visit HistoricNewEngland.org for details. The Phillipses’ Brougham was made in the 1880s by Ferdinand F. French of Boston. Rubber tires offered a smooth ride, and luxurious fittings provided comfort and elegance. Stevie’s boyhood coincided with the transition in transportation from carriages to cars. After graduating from Harvard in 1929, Stevie and four friends explored the western United States in a Model A Ford Phaeton, an adventure-filled trip that included driving from the Canadian Rockies, down the Pacific Coast Highway to the Grand Canyon and ended with watching the annual Pike’s Peak Hill Climb in Colorado. In 1942, Stevie and his bride, Bette, purchased a 1929 Model A Phaeton to keep at the family’s summer home in New London, New Hampshire. For Stevie, the car likely brought back fond memories of his bachelor days, in addition to providing the couple with a means of exploring the countryside. Evidently, the Phillipses were attached to their vehicles, for they continued to store them in the carriage barn behind the house even when they were no longer in use. The well-preserved collection of five carriages and three automobiles continues to delight visitors to the property today. and convenience. The family rented a car from Cooper’s Garage in Salem. Patrick O’Hara, the chauffeur, would collect the car from the garage, bring it to the house, and then drop Mr. Phillips at the train station, run errands, or take the family to call on friends. When the Phillipses ventured on longer trips, some of the domestic staff accompanied them to ensure their needs would be met both on the road and at their destinations. In 1924, Mr. Phillips purchased the family’s Pierce-Arrow Series 33 Touring Car. At the time, Pierce-Arrows enjoyed the reputation of being among the finest automobiles available. Buyers would choose the chassis and then select the engine size, ignition system, and color, as well as any trim, like monogramming, for a cost ranging from $5,250 to $8,000. Mr. Phillips was so pleased with the car that in 1936 he purchased a second Pierce-Arrow—an Enclosed-Drive Limousine—for around $5,000. Featuring a twelve-cylinder engine, white ash framework, and a vacuum-powered brake system, the vehicle was used until his death in 1955.
the foreground, while the 1936 Limousine, with its aerodynamic form, is at the rear. below Designed for fair-weather driving, the Ford Phaeton has a folding top and no side windows.